I named this luscious knit Nan, because now I am one – a new grandmother that is, and that’s reason to celebrate! Nan is a double-breasted cardigan to be worn all buttoned up or not, as it drapes evenly due to its abundant collar. The wonderfully versatile (and reversible) Seeded Rib Check stitch pattern (a simple 4 stitch by 12 row repeat) adorns its overlapping center front panel and collar. 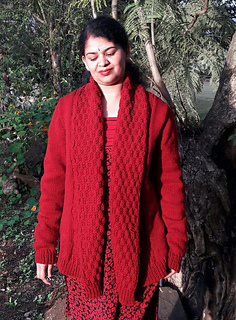 This is a top-down knit, made in one piece, except for the sleeves (also top-down), that are worked separately and set-in. Short rows even out the gauge differences between stitch patterns – with a row tracker included in instructions to keep the knitting simple. Shown in size 37”/94 cm, worn with approx 1”/2.5 cm ease. Shown in Cascade 220 wool by Cascade Yarns. (100% Peruvian Highland wool; 220 yds / 200 m per 3.5 oz / 100 g skein); color – Lavender Violet #9659; 5, 6, 6, 7, 7, 8, 9 skeins, or for comparable yarn, approx 1060, 1170, 1320, 1435, 1550, 1680, 1810 yards / 970, 1070, 1210, 1315, 1415, 1535, 1655 m. I always have additional on-hand for yarn differences and for swatching. Long-tail CO, provisional CO, cable CO, circular knitting, decreases (ssk, k2tog), increases (RLI, LLI), short row shaping at shoulders and throughout the collar/front panel at regular intervals, seaming at back neckline, blocking, and setting in sleeves. 11 page PDF includes pattern instructions, photographs, assembly diagrams, schematics, stitch description and chart, row tracking grid for managing short row intervals, helpful links to online tutorials, and definitions for relevant abbreviations.